Rheumatoid arthritis (RA) is an autoimmune disease with complex pathogenesis and an extremely high morbidity rate, which seriously affects the quality of the life of patients and brings economic burden to society. Thus, effective treatments of RA has become a global concern of the pharmaceutical industry. The purpose of RA treatment is to relieve pain, reduce inflammation, protect joint structure, maintain function and control the human body system. At present, the therapeutic drugs for RA mainly include non-steroidal and anti-inflammatory drugs, disease-modifying anti-rheumatic drugs, hormones, biological agents and others. According to a report of Evaluate Pharma, sales of global RA drugs reached 53.3 billion USD in 2016, an increase of nearly 4.5 billion USD compared with 48.8 billion USD in 2015. 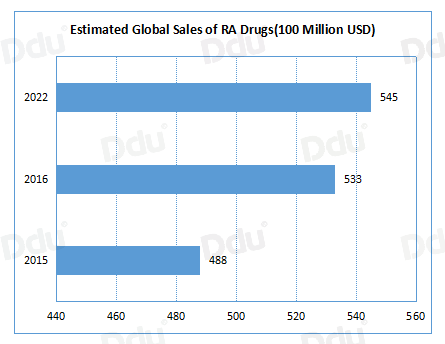 It is estimated that by 2022, global sales of RA drugs will reach 54.5 billion USD. 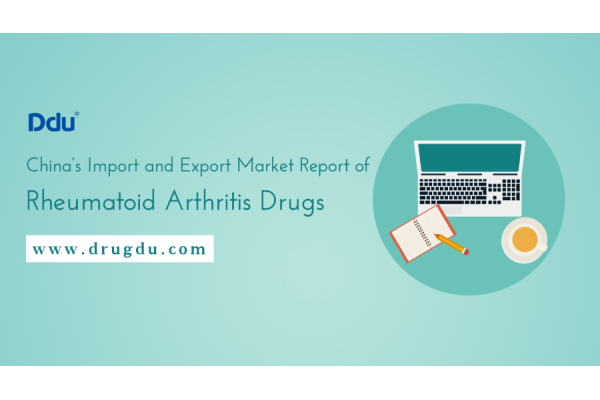 At present, the total number of patients in the global RA drug market (USA, Japan, the European Union, the United Kingdom, Italy, France, Spain, China, and India) has exceeded 7 million, and it is expected to exceed 8.5 million in 2023. Additionally, as the world's largest market for RA treatment, the United States is expected to maintain its leading position by 2023. Humira, the best-selling drug from Abbvie in the global RA drug market, accounts for 30% of the top 10 RA drugs. 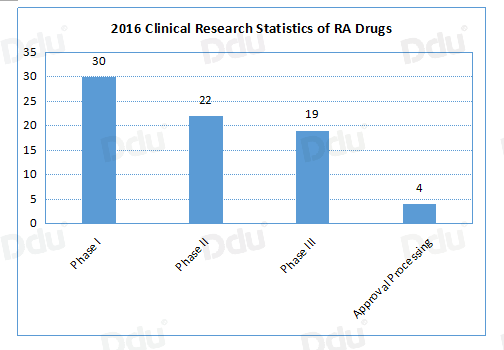 According to the statistics of PhRMA (Pharmaceutical Research and Manufacturers of America), there are currently 74 RA drugs in the process of clinical research around the world, of which 19 are in phase III and 4 of them have been submitted to the FDA for new drug application, which indicates that the global RA drug market is increasingly fierce. 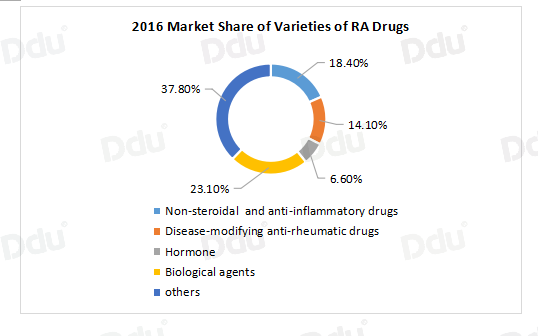 With the advent of an aging society and influences such as obesity, diabetes epidemic diseases and environmental factors, the number of RA patients in China has increased year by year, which has lead to the development of the RA drug market. 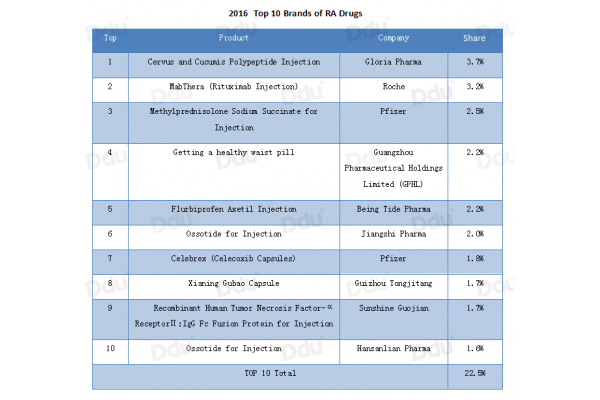 From 2013 to 2016, the scale of China's RA drug market has been steadily expanding, and in 2016, it exceeded over 60 billion RMB, showing greater market potential in the future. 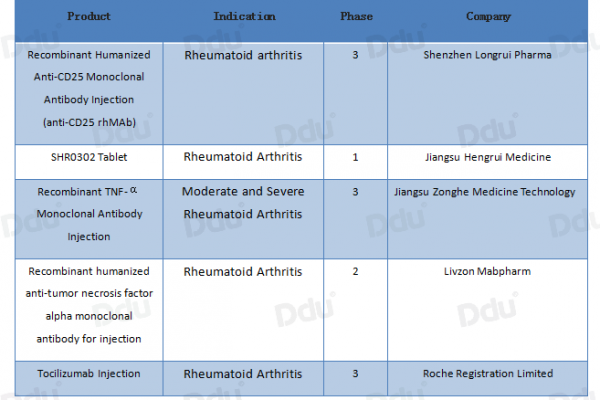 China's research on RA started relatively late with rapid progress and is further promoted by the refinement and standardization of medical application in the Chinese market. Out of the top 10 brands of RA drugs in China in 2016, there are 7 domestic companies, showing strong competitiveness. Moreover, biologic agents have been successfully used to treat RA, which means that now biomacromolecular drugs are available for RA treatment. With the development of the Recombinant Human TNF Receptor-IgG Fusion Protein for Injection, biological agents have become widely applied in the RA drug market, further increasing its market share. According to the statistics of PDB in 2016, products of biologic agents took up the highest market share, reaching 23.1%. In addition, there are many domestic products that are in clinical trials. In terms of the domestic market, RA drugs with technical content are imported to meet the domestic demand. 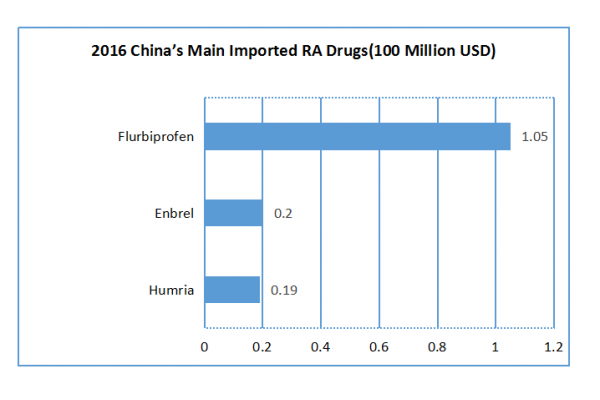 According to the statistics of China customs, the main imported RA drugs in 2016 were Humria, Enbrel and Flurbiprofen. Since Humria was approved to be imported in 2010, its total imports reached 0.19 billion RMB in 2016. Enbrel was on the market earlier abroad and was given the approval of import almost simultaneously with Humria. However, in 2016, the total imports of Humria reached 0.2 billion RMB, which was slightly better than that of Humria. Flurbiprofen is an excellent variety of non-steroidal anti-inflammatory drugs with a strong effect by using a small therapeutic dose. In 2016, the demand for flurbiprofen in China reached 640 million Yuan, a year-on-year increase of 28.88% compared with that in 2015, of which 83.59% was occupied by Flurbiprofen Axetil Injection from Beijing Tied Pharma and Flurbiprofen Axetil Injection from Mikasa Seiyaku took up the rest 16.41% with imports of 105 million Yuan. Biologic agents have been successfully used to treat RA, which means that now biomacromolecular drugs are available for RA treatment. TNF-α antagonists are currently the most widely used biological agents. And Recombinant Human TNF Receptor-IgG Fusion Protein, developed in China, has taken a certain share of the market such as Recombinant Human TNF Receptor-IgG Fusion Protein for Injection from Zhejiang Hisun Pharmaceutical Co., Ltd.
Zhejiang Hisun Pharmaceutical Co., Ltd.
One of the top 100 industrial enterprises with comprehensive strength in China's chemical and pharmaceutical industry. Main exporting countries: over 70 countries and regions around the world like Japan, UAS and UN etc. In addition to biological agents, China's Flurbiprofen Axetil Injection and Iguratimod Tablets also sell well. Representative companies are Beijing Tide Pharma and Simcere. China's first high-tech pharmaceutical company that develops, produces, and sells a series of targeted drugs. Main exporting regions: over 70 countries and regions around the world like Europe, America and Asia. One of China's top 100 pharmaceutical companies. Western medicines are no longer permanent solutions to treat chronic disease like RA due to side effects to the liver and kidneys. Biologics, as the currently advanced technology in RA treatment, has a rapid onset of action, a strong curative effect, and less adverse reactions and significantly improve the condition as well as inhibiting bone destruction, which is preferred by the international market. With the continuous development of science, efforts of R&D personnel, and the constant disclosure of the causes of RA, RA biosimilar drugs will flood in to the market in large quantities. Before the market for RA treatment becomes saturated, discovering drugs with novel mechanisms as soon as possible will become key for Chinese pharmaceutical enterprises to enter the international market.